PureProR ROYAL RO system uses the most advanced water treatment technology: "Reverse Osmosis". Reverse Osmosis (RO) is recognized as one of the best available technologies for producing best quality drinking water. It's also the same method used by many bottled water companies to make safe and great tasting water. No other home water treatment system can offer you as much protection and reliability. PurePro ROYAL RO system uses 100GPD membrane which is powerful, fast and excellent efficiency. 100GPD membrane increase the daily production capacity and the speed of RO water production. This allows for better assurance that there is adequate water available when desired, even during heavy use times of the day. 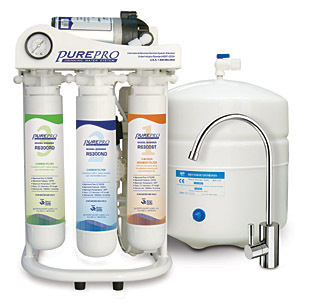 PurePro ROYAL RO with its supreme quality ensures a great water flow rate with absolutely the least wasting of water. The newly designed ROYAL RO system is user friendly with design simplicity in mind. It requires no tools for filter changes. Use twist and quick-change cartridge design makes filter changes fast, clean and easy. This space saving allows maximum use of your under counter space. PureProR Best Seller Faucet (European Design Faucet).